A poor thief who has been struggling with health conditions after a serious car crash and benefit problems resorted to shoplifting at a Primark store. 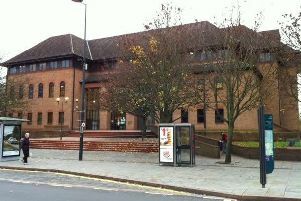 Chesterfield magistrates’ court heard how Graeme Gibbons, 40, of Handley Road, at New Whittington, Chesterfield, concealed garments down the front of his clothing and under his jacket at the store in Chesterfield. Prosecuting solicitor Becky Allsop said: “Mr Gibbons was seen in the Primark store picking up gloves and a hat and he concealed them down the front of his clothing. Gibbons paid for a low-value item, according to Mrs Allsop, but he was stopped leaving the shop. The defendant told police he had been desperate because he had changed his benefits to Universal Credit and was not going to receive any money for three weeks so he sold a possession to raise cash but lost this money. Gibbons, who has previous convictions, pleaded guilty to the theft which happened on November 6. Defence solicitor Karl Meakin said Gibbons had been in a car crash in 2012 and he lost two friends and suffered a broken back and had been left in a coma. Mr Meakin added that Gibbons suffered significant brain injuries which left him with epilepsy and low moods. The defendant has been managing to cope but delays with Universal Credit had created financial problems. Gibbons had sold an XBox 360 to raise cash but lost the money, according to Mr Meakin, and he stole clothes for himself and to sell on. Magistrates sentenced Gibbons to a 12 month conditional discharge but warned if he re-offends he will be re-sentenced for the theft and any new crime.